Books, however, can’t tell A In Chinese, peng you means friend. But in any language, all Anna knows for certain is that friendship is complicated. To ask other readers questions about The Year of the Book, please sign up. Orinoco Womble (tidy bag and all) You might get a copy from the library and read it. Then you'd even know what it's about. It's not a great story, but it's great because it is a year in the life of a modern, American Born Chinese girl. Here's why it's a powerful book to be familiar with as a fourth grade teacher. It's written at an AR 3.6 level - very much an "on the cusp" reading level for a somewhat struggling beginning fourth grader. It's a chapter book, but it's semi-illustrated so it's a good transitional book for those girls reading Junie B. Jones. It gets better. The character struggles with writing prompts and thinks through her thought process. She explains how she gets "lost in her book world" and constantly makes text-to-world and text-to-self connections. She feels like an outsider and struggles with a girl who is an on-again off-again friend, but eventually there is some genuine insight into how other families can be very different from our own. Oh, and instructions on how to sew bags, make wontons and even learn a few Chinese characters! When a librarian sees a title of a book with the word “books” in it, it just has to be read. And I am so glad I did. This is a sweet story of friendship and how it is not always a smooth journey. Anna Wang is in fourth grade and in the past Laura has been her friend. But now Laura seems to spend more time with Allison and Lucy and Anna just doesn’t fit in. To escape the loneliness, Anna turns to her books. She finds courage in pages of My Side of the Mountain, and acceptance of her Chinese herit When a librarian sees a title of a book with the word “books” in it, it just has to be read. And I am so glad I did. This is a sweet story of friendship and how it is not always a smooth journey. Anna Wang is in fourth grade and in the past Laura has been her friend. But now Laura seems to spend more time with Allison and Lucy and Anna just doesn’t fit in. To escape the loneliness, Anna turns to her books. She finds courage in pages of My Side of the Mountain, and acceptance of her Chinese heritage in the pages of My Louisiana Sky. Anna is an ABC – American born Chinese. Her father is a manager of a Quik mart, and her mother cleans apartments but is studying hard to get her driver’s license and to become a nurse. Anna needs to attend Chinese school every Saturday which is just another thing that makes her so different from the other girls in her class. But Anna discovers that not everything is as it seems. Laura is going through a very difficult time in her family and needs Anna’s support and friendship. At Chinese school, she meets Camille and discovers, with a little courage, she has another new friend. Anna learns that though books are wonderful, nothing beats the value of a true friend. I picked up this book from the library because I noticed the author's Chinese last name and also the Asian-American girl in the cover illustration. I'm always on the lookout for more diverse children's books, especially books by and about Asian-Americans, since I am Asian-American myself. As it turns out, the author is not Chinese! But presumably her husband is. Despite not being Chinese herself, I think the author did a fine job portraying the realities of growing up Chinese in America. She mak I picked up this book from the library because I noticed the author's Chinese last name and also the Asian-American girl in the cover illustration. I'm always on the lookout for more diverse children's books, especially books by and about Asian-Americans, since I am Asian-American myself. As it turns out, the author is not Chinese! But presumably her husband is. Despite not being Chinese herself, I think the author did a fine job portraying the realities of growing up Chinese in America. She makes casual mention of Chinese dishes and snacks, and even includes Chinese school - a typical part of the Chinese-American experience - as part of main character Anna Wang's struggles. Though Anna Wang does need to come to terms with her Chinese-ness, I think the real focus of the story is Anna's struggle to make friends while 1) being an introvert (she would rather read or stay home and make airplanes with her brother and father than put effort into becoming better friends with Laura) and 2) negotiating the mean girl dynamics at school. Young readers who prefer the solitude of books, or who have felt the sting of being left out, will be able to relate to Anna Wang. I'm not entirely sure, though, that Anna Wang is a likable character. The book kind of starts off with a bit of a melancholy tone, with Anna feeling down about not really fitting in anywhere. Her narrative voice is very matter-of-fact, not especially emotional, and she comes across as stand-offish. Interestingly, Anna seems more comfortable befriending adults like Mr. Shepherd and Ray than kids her own age. (It's lucky she has such kind and thoughtful adults in her life!) She's not even afraid to address a note to the school principal. Her ability to interact so confidently with adults makes her seem more mature, and "above the fray" that Laura gets caught up in - and I do like that about her. I also like that she spends her non-reading time doing arts and crafts and sewing for fun. She is both creative and productive! I think this book also can reach a certain audience through Laura, Anna's friend who has troubles at home. I've read a lot of children's books, and it seems pretty rare for one to feature a character whose parents don't actually get along. Seems to me that some young readers might appreciate being able to relate to Laura, and it's only too bad that her character, and her family, are not fleshed out more. Also, Laura's problems were clearly a catalyst in strengthening Anna and Laura's friendship. It almost seemed like it was too easy for Anna. She doesn't put much effort into making friends with Laura, but she doesn't have to, really, because Laura is thrown into her life, and Anna is forced to spend time with her. Two final thoughts, one good, one bad. The good: I always like it when a children's book can motivate readers to pick up other books, and this book mentions by name a whole bunch of books that Anna spends her time reading. I used this as a read aloud in my classroom. It was a hit with boys and girls alike. The characters were interesting, the theme was positive and exhibited a strong message about friendship and compassion. My students also commented that they liked the integration of some Chinese language and culture. Anna Wang is ABC (American-born Chinese) in the fourth grade who loves to read. She's quiet, self-conscious, considerate, and a bit of a contemplative. She usually gravitates toward adults; they don't change their mind about friendship like girls her age. Anna doesn't like Chinese school, is embarrassed by her mother's imperfect English, and avoids the people who have hurt or disappointed her before. All very realistic. One feature of the story is our peek at Anna's reading list. We get little t Anna Wang is ABC (American-born Chinese) in the fourth grade who loves to read. She's quiet, self-conscious, considerate, and a bit of a contemplative. She usually gravitates toward adults; they don't change their mind about friendship like girls her age. Anna doesn't like Chinese school, is embarrassed by her mother's imperfect English, and avoids the people who have hurt or disappointed her before. All very realistic. One feature of the story is our peek at Anna's reading list. We get little teaser summaries of classics (new and old) that could become a reading challenge. I found this book because I am doing an Alphabet Reading challenge and none of the libraries near me had the book I wanted to read for "Y"; so I just looked randomly on the shelves and this was the first one I came across that the synopsis didn't repulse me. It was a cute little book! A nice, easy beginner reader about a girl who likes to read books learning how to become friends and get outside into life. It's just a very quiet, gentle book about growing a little bit. I enjoyed it after some of I found this book because I am doing an Alphabet Reading challenge and none of the libraries near me had the book I wanted to read for "Y"; so I just looked randomly on the shelves and this was the first one I came across that the synopsis didn't repulse me. This book was very very good. It is definitely in my top 3 books that we have read for the parent/child book club at our beloved APL. I like the the author's writing style, it kept my interest and was simple while being profound at the same time. I also thought it was an excellent illustrations about what 4th grade is really like, especially for kids who are in grade school today. So many parts of this book made me think of my 4th grade daughter's real experiences every day. The friends who are This book was very very good. It is definitely in my top 3 books that we have read for the parent/child book club at our beloved APL. I like the the author's writing style, it kept my interest and was simple while being profound at the same time. I also thought it was an excellent illustrations about what 4th grade is really like, especially for kids who are in grade school today. So many parts of this book made me think of my 4th grade daughter's real experiences every day. The friends who are sometimes nice, sometimes not. The competition amongst friends - with an odd man out. The peer pressure put out there by some friends to always do things their way, or do the things they say. The judgemental-ness of 9 and 10 year olds - not always listening to directions themselves, but judging someone else's work to be wrong or weird anyway. This book was really very well done. And the real life issues, like Laura's scary dad and him knocking on Anna's door to find her...this book doesn't shy away from some of the parts of life that aren't all that pretty. In this story, a shy Chinese-American girl turns to books to get through her fourth grade year but learns to make friends with a little girl whose family is going through a bad divorce, an elderly widowed man, and her school's crossing guard. What I enjoyed about this book was that Anna reminded me of me--I had a terrible time making friends as a child and also dove into books. I also liked that the book addressed divorce, a parent whose first language is not English and is going to college, and In this story, a shy Chinese-American girl turns to books to get through her fourth grade year but learns to make friends with a little girl whose family is going through a bad divorce, an elderly widowed man, and her school's crossing guard. This is a sweet, quick read. I enjoyed it, although I felt like more needed to happen. I don't think I will remember much of this book for very long. There are lots of fun literary references though! This reminded me a bit of Project Mulberry by Linda Sue Park. Anna Wang is afraid she's losing her friend Laura to Allison and Lucy, but she doesn't know what to do about it. She's more comfortable with her books and crafting activities. In addition, her mother's job of cleaning isn't something she wants known because she doesn't find it something to be proud of, despite the fact that her mother is working toward attending nursing school while learning English and how to drive. Anna struggles to know how to be a friend to Laura when she wants to do other t Anna Wang is afraid she's losing her friend Laura to Allison and Lucy, but she doesn't know what to do about it. She's more comfortable with her books and crafting activities. In addition, her mother's job of cleaning isn't something she wants known because she doesn't find it something to be proud of, despite the fact that her mother is working toward attending nursing school while learning English and how to drive. Anna struggles to know how to be a friend to Laura when she wants to do other things, especially when it becomes apparent that things are not going well for Laura at home and Laura still seems to prefer Allison. But gradually, with the help of her family, Anna learns what it means to be a good friend. Cheng has created a great character in Anna, one that I could really relate to, because I was a lot like her. While I'm not Chinese American, I could relate to Anna's social awkwardness and love of reading. I enjoyed reading about Anna's family's Chinese traditions as well. This is a fun series for young readers about growing up in America while keeping one's own heritage alive and well. A sweet, middlegrade story of friendships, growing pains, fitting in and forgiveness. This is the first book in the series. Anna is an ABC - American Born Chinese. She's trying to figure out where and how she fits in, especially when her best friend starts spending time with some girls who aren't so nice to Anna. Sweet little book about a third-grade girl learning to be a friend. Probably the best kid-lit I read for the first time for my job this school year, complete with casual diversity and lovely realistic depictions of how children struggle to process peripheral drama of the adults in their lives. A solid chapter book for 3rd or 4th graders. It may especially appeal to a young book lover who is more introverted or struggling with friendships in his or her own life. I enjoyed how the main character was able to relate her "book friends'" experiences to her own life. I enjoyed reading this book, very much! I really like this charming little middle grade book. I appreciate that it tells a contemporary story with an ABC (American Born Chinese) protagonist that has some Chinese cultural things sprinkled through without making the heritage a “problem” in her life or in her relationship with her friends. I think Andrea Cheng really captures that 10-year-old-book-lover-in-the-process-of-sorting-out-friendship-and-family-relations spirit and she successfully implies many emotions and events without ever I really like this charming little middle grade book. I appreciate that it tells a contemporary story with an ABC (American Born Chinese) protagonist that has some Chinese cultural things sprinkled through without making the heritage a “problem” in her life or in her relationship with her friends. I think Andrea Cheng really captures that 10-year-old-book-lover-in-the-process-of-sorting-out-friendship-and-family-relations spirit and she successfully implies many emotions and events without ever becoming overtly preachy or melodramatic. The cover is lovely. The trim size is cozy. The occasional illustrations cannot be more warm or eye-pleasing. I think it will be loved by many readers and teachers can happily use it with their students. After all, there is the subtle mean-girl scenario that is handled so well and there is reading and writing realistically reflecting many students’ experiences. On page 45: When discussing about what the moon is like… Anna says that her mom told her the moon is an old lady… which is definitely news to me. Traditionally we think of these three characters as long term residents on the moon: The Goddess Chang Eh, the Wood Cutter Wu Gang, and the Jade Rabbit. Sometimes we also say that there is a magical Toad on the moon. But, old lady? Hmm… This could just be the result of different families and the stories they pass down. On page 76: The text says that the Chinese teacher is teaching words like snow, ice, and cold. The illustration shows the Chinese characters of Snow, Ice, and Cold correctly — but the English label shows, Snow, Ice, and Wind. On page 110: (I verified this with the pronunciation guide and also the author’s own text on page 143.) The text shows, “We sit at the kitchen table and have my favorite bean paste, bao zia, for a snack.” Chinese eat sweet bao zi (steamed buns) with red bean paste filling as snacks, but I seldom see people eat bean paste directly … and bean paste is called “dou sha,” not “bao zi.” Here also, zi is mistyped as zia, which is not a sound found in Chinese words. On page 136: When making the timeline, Anna puts down her birth year as 1998 and states that it’s the Year of the Dog. This is erroneous. 1998 is the Year of the Tiger. Year of the Dog is either 1994 or 2006. These are all non plot-essential mistakes and it does not take away the integrity of the character development or the flavor of the setting. However, in this day and age where we are teaching each other and our children to be culturally sensitive and as accurate as we can be, and where Chinese speaking and writing people who can take a quick look and point out mistakes to be corrected before going to print should not be very hard to find, finding these many mistakes in one small, 146-page book simply stuns me. I love books about books...about kids who love to read. This book is written for a fourth-grade audience, but I liked it just the same. The protagonist is a book-o-phile who even hates to go to school because it cuts down on her reading time. Socially, she doesn't fit in...go figure. My only criticism (and it is mild) is that some of the books Anna reads are a bit sophisticated for the intended audience of THE YEAR OF THE BOOK. Even I love books about books...about kids who love to read. This book is written for a fourth-grade audience, but I liked it just the same. The protagonist is a book-o-phile who even hates to go to school because it cuts down on her reading time. Socially, she doesn't fit in...go figure. My only criticism (and it is mild) is that some of the books Anna reads are a bit sophisticated for the intended audience of THE YEAR OF THE BOOK. Even classics like E.L. Konigsburg's FROM THE MIXED-UP FILES OF MRS. BASIL E. FRANKWEILER might be a stretch for kids just learning to read. Other titles, like Jacqueline Woodson's HUSH (about a murder witness who goes into the witness protection program) or MY LOUISIANA SKY by Kimberly Willis Holt (about a girl dealing with her mentally disabled mother), might be deemed inappropriate for newly minted readers. Nevertheless, it is rare to find a chapter book that so deftly captures the inner life of its protagonist in such simple and absorptive language. THE YEAR OF THE BOOK does not talk down to its readers or make any assumptions about what they should or should not be reading. Instead, it finds a way to bridge the many challenges Anna must deal with, whether it's relationships with friends and family, or how to be your own person without excluding others. This book covers the ups and downs of Anna Wang’s grade four year. Anna is a quiet, meticulous child who enjoys reading and sewing. She is less enchanted with Chinese school, which her mother insists she attend, and is wary of her fair-weather friend Laura, who seems to prefer the company of mean-girl in training Allison. Author Andrea Cheng nails the politics of childhood, especially triangular relationships. Laura seems to prefer Anna’s company, but chooses Allison over Anna when push comes to This book covers the ups and downs of Anna Wang’s grade four year. Anna is a quiet, meticulous child who enjoys reading and sewing. She is less enchanted with Chinese school, which her mother insists she attend, and is wary of her fair-weather friend Laura, who seems to prefer the company of mean-girl in training Allison. Author Andrea Cheng nails the politics of childhood, especially triangular relationships. Laura seems to prefer Anna’s company, but chooses Allison over Anna when push comes to shove. Allison is that dominating, bossy person who pits people against each other and makes everyone vie for her attention. We’ve all known girls like this. Under Cheng’s careful character study, neither Allison or Laura are totally demonized, but we (the reader and Anna) are given little insights into why they behave the way they do. This is a fine balance to achieve but Cheng pulls it off marvelously. This is one of those rare early chapter books that gets everything right: the level of language (not too sophisticated), friendship and parental anxieties, chapter length, font size, use of illustration. Everything here is perfect for grade 3, 4 maybe even 5 readers. Her tone reminds me of Jean Little’s middle grade; straight forward, honest and sensitive. She is a writer who knows how important moments of comfort (food, routine, family) are to young readers. Abigail Halpin’s black and white spot illustrations add warmth and charm to the story. An easy and pleasant read about an American born Chinese girl, dealing with everyday problems and reading lots of books. Anna is in 4th grade (around 9-10 years old? ), loves to read, doesn't like to learn Chinese, and isn't very good at friendships. Because of the events, she meets a new girl and also learns to appreciate more the time she spends with her childhood friend. An easy read with a small number of pages, nice illustrations and a low level of language. I'm not complaining here, it's a go An easy and pleasant read about an American born Chinese girl, dealing with everyday problems and reading lots of books. What a delightful easy reading book for students here at the high school who can connect to any number of the traits, qualities, and interests Anna has 1) reading (maybe that's why I enjoyed the book so much as she references the books she's reading, likes to read, reading in a pillow-filled bathtub in a teacher's classroom, etc. 2) she's having friend issues, particularly being abandoned by her best friend in favor of a few girls she doesn't necessarily like, 3) she's American-born Chinese navi What a delightful easy reading book for students here at the high school who can connect to any number of the traits, qualities, and interests Anna has 1) reading (maybe that's why I enjoyed the book so much as she references the books she's reading, likes to read, reading in a pillow-filled bathtub in a teacher's classroom, etc. 2) she's having friend issues, particularly being abandoned by her best friend in favor of a few girls she doesn't necessarily like, 3) she's American-born Chinese navigating her parents' hopes and dreams with reality, attending Chinese classes though she reads rather than listens and participates, 4) she's kind-hearted, visiting the crossing guard who wasn't at his post, talking with Mr. Johnson who her mother cleans for, 5) she's curious and has some neat interests like sewing and crafts which are shared related to both Chinese crafts to making won-tons and more. In fourth grade, Anna Wang's friend Laura is more interested in spending time with Allison than with her, and Anna retreats into the world of her books. As the year progresses, Anna learns that Laura's life is not as happy as it seems, and she rediscovers friendship. The book proceeds as a series of first-person vignettes that provide a window into the life of the main character and her social development over the course of the year. The vignettes treat themes of loneliness, social isolation, emb In fourth grade, Anna Wang's friend Laura is more interested in spending time with Allison than with her, and Anna retreats into the world of her books. As the year progresses, Anna learns that Laura's life is not as happy as it seems, and she rediscovers friendship. Anna is a fourth grader who is trying to navigate through the perils of being an almost middle schooler. She finds the most comfort when reading her cherished books. Anna's friendships are changing; she wants things to stay the same, but her friends are starting to get new interests, such as clothes and shopping. Anna thinks being at home can be tough too because her mom has a job that she doesn't want other kids to know about (cleaning people's houses) and her mom still hasn't learned to drive Anna is a fourth grader who is trying to navigate through the perils of being an almost middle schooler. She finds the most comfort when reading her cherished books. Anna's friendships are changing; she wants things to stay the same, but her friends are starting to get new interests, such as clothes and shopping. Anna thinks being at home can be tough too because her mom has a job that she doesn't want other kids to know about (cleaning people's houses) and her mom still hasn't learned to drive yet. Anna also has to go to Chinese school on Saturdays and learn new words and how to write them. She slowly starts seeing that the grass isn't always greener on the other side. Anna also opens her eyes to meeting new friends and accepting change with her old friends. I think 3rd and 4th grade girls will like Anna's story and be able to relate to her. It was fun seeing a lot of familiar books mentioned within the story as well! This story follows Anna through fourth grade as she struggles with friendship, her relationship with her mother, and her identity as an American Born Chinese (ABC). Being a book lover, Anna has books to help keep her company as she navigates the year. The writing is simple and uncomplicated. There are some nice little illustrations by Abigail Halpin, and the book is filled with tidbits of information about Chinese culture. Younger kids will love recognizing the titles Anna loves, and probably en This story follows Anna through fourth grade as she struggles with friendship, her relationship with her mother, and her identity as an American Born Chinese (ABC). Being a book lover, Anna has books to help keep her company as she navigates the year. The writing is simple and uncomplicated. There are some nice little illustrations by Abigail Halpin, and the book is filled with tidbits of information about Chinese culture. Younger kids will love recognizing the titles Anna loves, and probably enjoy reading about books they haven’t read yet. Overall it's a very sweet little book, and might be of interest to some EL students, or to those girls who love to see the names of books they've read mentioned in other books, but it's really on the younger side. I imagine you could sell it to some girls in third to possibly fifth grade. Found on Goodreads as a recommendation, this is a delightful tale of young Anna Wang who loves books. Straddled between two cultures, Anna is embarrassed by her mother's Chinese ways and yet she loves her family, hoping they can be more American. As most coming of age books, this one deals with learning how to be a friend and how to accept friendship. Unsure of her life, books are Anna's companions. When she befriends Laura, she gradually learns of Laura's family life and the fact that Laura's fath Found on Goodreads as a recommendation, this is a delightful tale of young Anna Wang who loves books. When she befriends Laura, she gradually learns of Laura's family life and the fact that Laura's father is an angry man who refuses to stop harassing his family when they ask him to leave. I just loved this book and I think it's because I can super identify with Anna. As a kid (and yeah, as an adult) I sometimes preferred my books to hanging out with real people. And when friendship starts to get complicated, sometimes that choice makes sense! This reminded me a lot of Grace Lin's Pacy books, although Anna has more angst. I can't wait to pick up the rest of the books! Sweet story about the difficulties of being a 4th-grade girl in today's world. Anna learns how to be herself even in the midst of mean-girl behavior from a few girls. Relying on reading frequently to get her through tough times. It is one of my faves from the 2014-2015 Bluebonnet list. 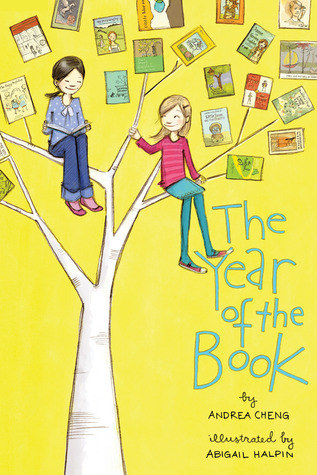 Warm, appealing friendship story about the power of books. “Hey, can you teach me the word for friend that you wrote on my card?"